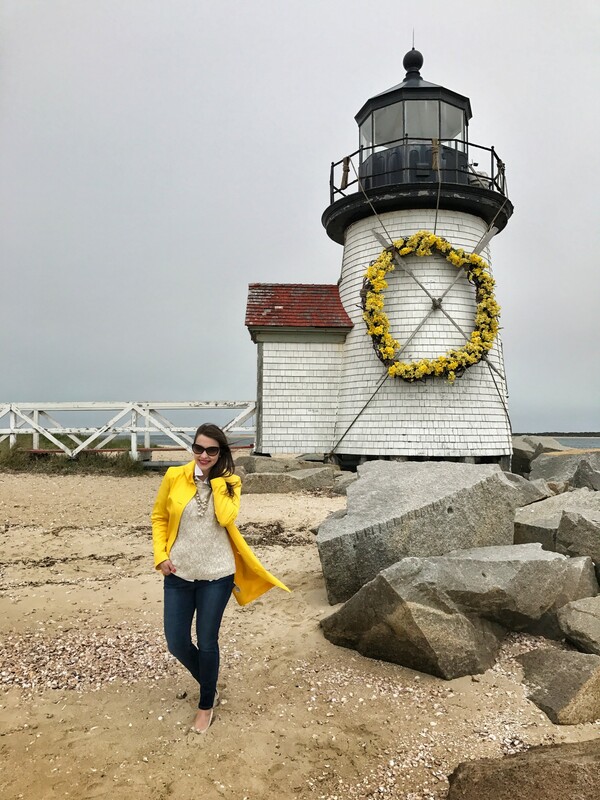 Daffodil Festival is always one of my favorite weekends to visit Nantucket, as it typically marks my first trip to the Island for the season! Daffodils decorate storefront window boxes, lawns, and meadows; essentially brightening every corner, and everyone is so excited that spring has finally sprung. Beyond my love for this weekend on the Island, I simply adore the story behind all of the gorgeous daffodils on Nantucket. Back in 1974, summer resident Jean MacAusland had the idea to begin planting what would amount to over four million daffodil bulbs across Nantucket; it was her way of adding to its beauty! Now in its 43rd year, the Grey Lady continues to beam with color, and the annual Daffodil Festival features a full schedule of activities for visitors of all ages. 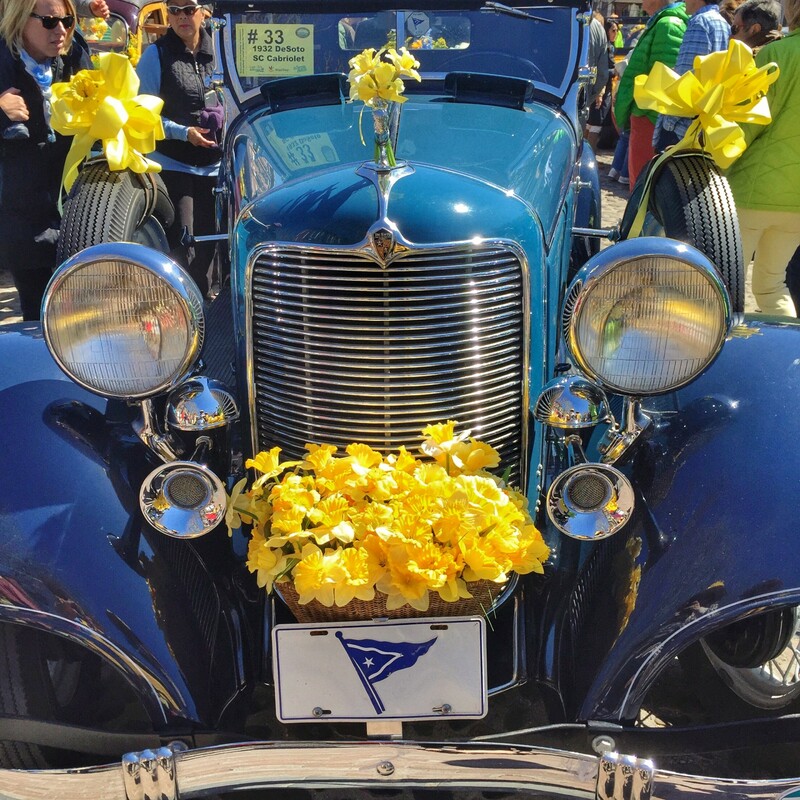 The 2018 Daffodil Festival will be held on April 27 – 29, and if you’re planning a visit, especially for the first time, I’ve rounded up my suggestions and a few helpful tips to ensure that you have a fabulous Daffy weekend on Nantucket! Believe it or not, your wardrobe for the Daffodil Festival is actually one of the main components for fully embracing this colorful weekend! Everyone, from babies to grandmothers, is decked out in cheerful yellow attire to celebrate the season. Thinking back to my first Daffy Festival, I remember being amazed at how much fun people had with their attire! From men sporting bold, yellow flowered pants to ladies sashaying around town in gorgeous yellow dresses and beautifully adorned hats, no one is shy about embracing the color of the weekend. In fact, it can even be a bit of a friendly competition to see who looks the most outrageously “daffy”! In addition to wearing copious amounts of yellow, I highly recommend making (or buying) a fun hat to wear during Daffodil Festival, especially on the day of the parade and tailgate. 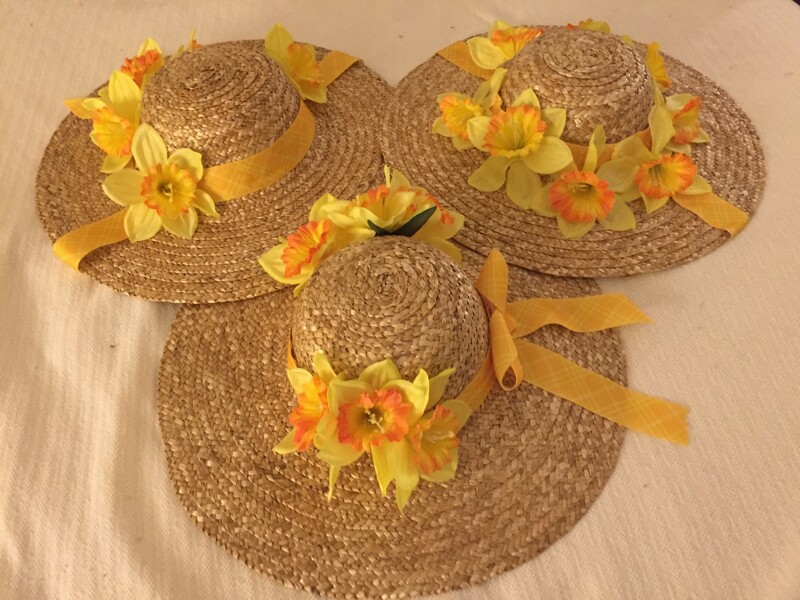 One year, my mom, mother-in-law, and I got crafty and created our very own daffodil-inspired hats with silk flowers and ribbon from Michael’s. As silly as I initially felt donning my creation down Main Street, I fit in perfectly, and the three of us received compliment after compliment on our stylish “daffy hats”! Long story short – leave your inhibitions at home and wear as much yellow as humanly possible! Want to show off your hat?! Don’t miss the Hat Pageant taking place on Saturday at 10:45 am at Children’s Beach, Harbor View Way. The Antique Car Parade is one of my favorite events during the weekend. Vintage cars, many of which come in to town via ferry, gather on the cobblestones of Main Street to participate in this festive gathering. Starting at 9:30 am, you can begin to make your way through over 100 classic cars, admiring one creatively bedecked automobile after another! It’s absolutely amazing to see how much time and effort the owners put into making their car stand out from the rest. At 12 pm, the cars will parade through downtown and out to Sconset for the tailgate picnic. My advice is to view the cars on the early side, as it gets increasingly harder to comfortably navigate between them when more and more people are out in the street. Make sure you have a camera handy! 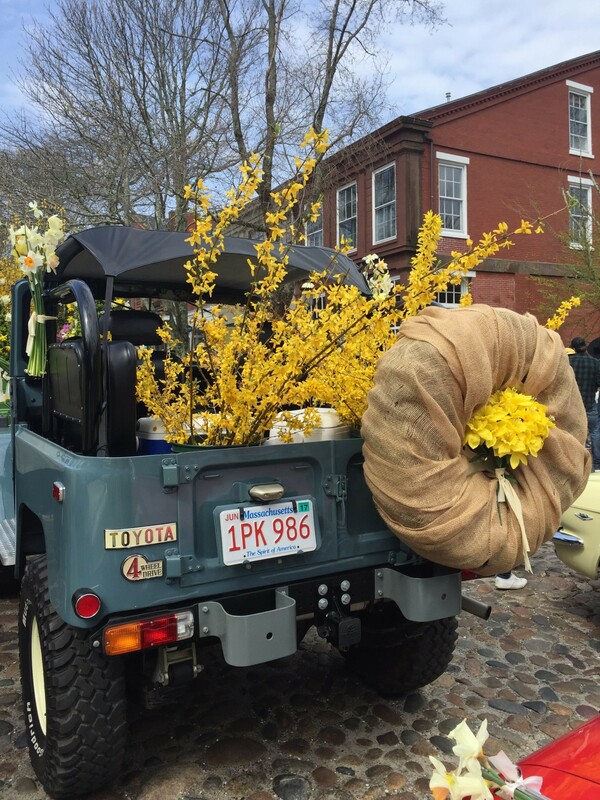 The annual tailgate picnic held in Sconset, which immediately follows the antique car parade, is, by far, the most unique part of the Daffodil Festival. Beginning around 1:00 pm, Main Street in Sconset transforms into a giant tailgate picnic. You really have to see it to believe it, but essentially, dozens of cars line up on either side of the road, pop open their trunks, and friends and strangers, alike, spend the afternoon eating, drinking, and making new acquaintances. Since this is Nantucket, the word ‘picnic’ takes on a whole new meaning, as people truly pull out all the stops to create the most elaborate set-ups. Think raw bar towers, candelabras set atop gingerly placed yellow tablecloths, champagne served in crystal flutes…you get the picture! Even if you don’t have your own picnic to set up along the street, it’s truly a sight to see. Rent a car or take a taxi, and don’t miss the tailgate! 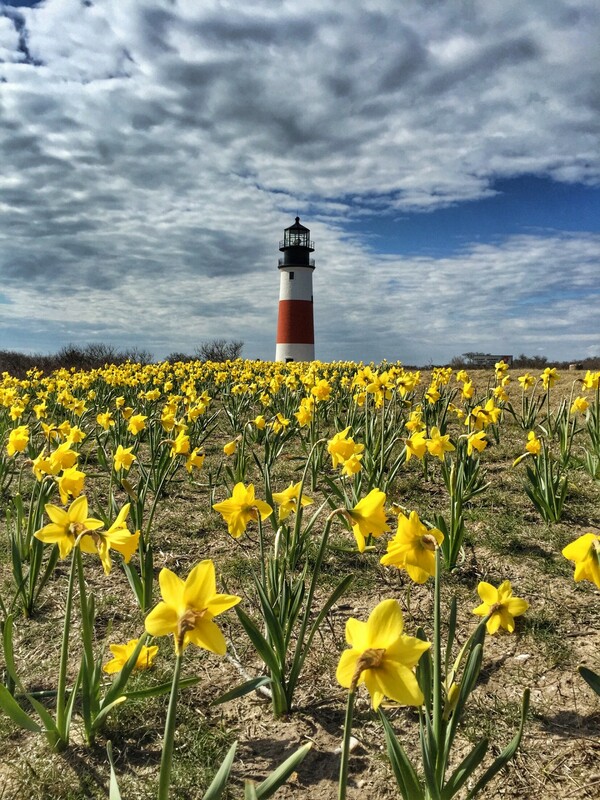 Located in Sconset, Sankaty Head Lighthouse is always on my must-visit list during Daffodil Festival. In the spring, over a hundred daffodils blanket the area surrounding the lighthouse and it’s absolutely picture perfect! If you’re renting a bike for the weekend, I highly recommend making the trip from town to Sconset via Milestone Road. This scenic route is filled with scattered daffodils and more importantly, features a safe, paved bike path that is easy to navigate. I will warn you that this is a fairly long bike ride with some hills (around 8.5 miles one way from town), so plan accordingly with water and comfortable clothing/footwear. Once in Sconset, the Sankaty Lighthouse is an easy 1.5 mile ride from the village center, and as I mentioned, in the springtime, it’s truly beautiful! 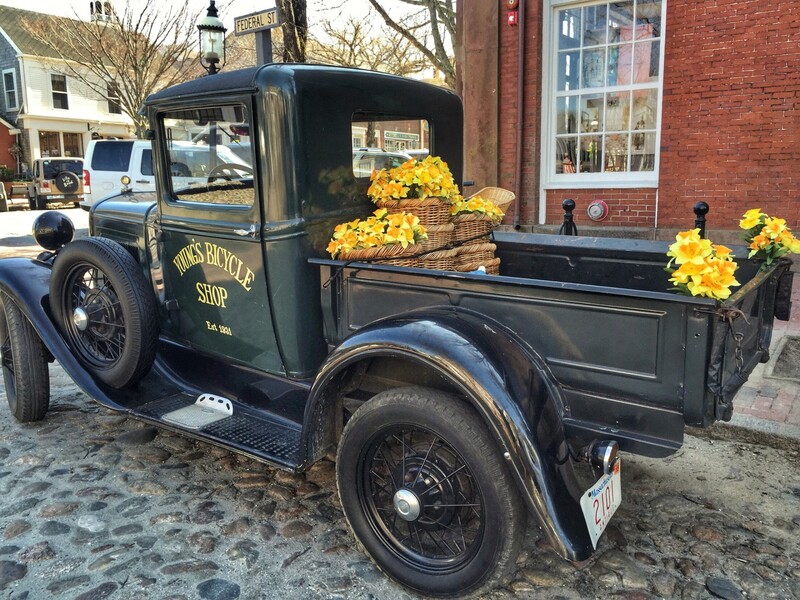 Similar to the diverse selection of events that the Island hosts during Christmas Stroll (I wrote a guide for that magical weekend on Nantucket here), the three-day Daffodil Festival really has something for everyone. For those seeking an athletic endeavor, there is a 5K race on Sunday, which you can still register to run in here, as well as various walking tours and a nature hike. 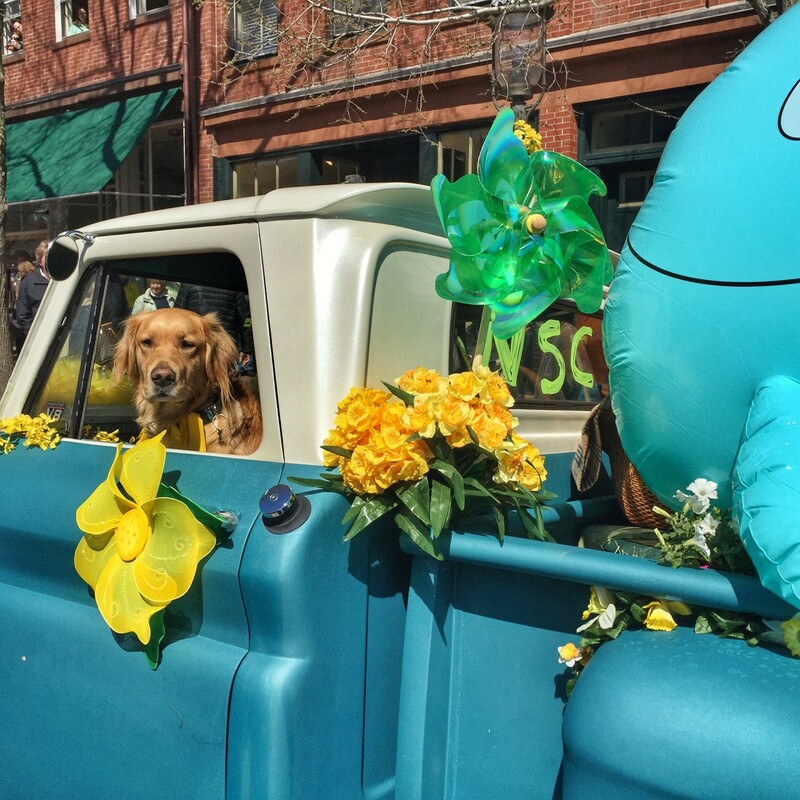 Animal lovers can enjoy the annual Daffy Dog Parade on Saturday at 12:30 pm on Lower Main Street, where they can dress up their favorite pooch in a daffy costume for a chance to win a prize. Depending on your interests, the 44th Annual Community Daffodil Flower Show at Bartlett’s Farm on Saturday, 2 pm-5 pm, is also always a hit! You can view the full schedule of Daffodil Festival events on this helpful website. TIP: use your time on the ferry or plane to highlight your must-do’s and see’s! -Dress in layers and bring an umbrella! I’ve experienced Daffy weekend in the pouring rain as well as in the shining sun and there’s nothing worse than not being prepared. Nantucket tends to be a bit chilly in the spring, so dress in layers that will allow you to adjust your attire (and temperature!) as the day goes on. Trust me, if you head to Cisco Brewers and are sipping Figawi Wowies in the sun all afternoon, you’re going to want to shed that extra jacket and still feel comfortable! -If you’re pressed for time and can only visit Daffy weekend for one day, come on Saturday. While all three days feature a variety of happenings, in my opinion, the most fun events occur on Saturday. I’d recommend booking the earliest and latest high-speed ferry via Steamship Authority or Hy-Line Cruises, so that you can enjoy an amazing day trip on Nantucket. If the ferry is sold out, keep calling/checking the website closer to departure, as there are often last minute cancellations that will afford you a coveted seat. 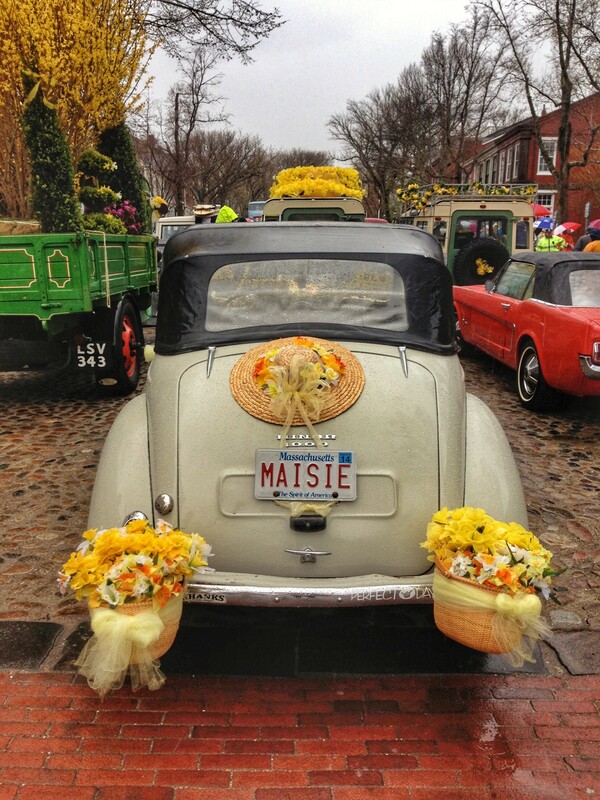 There are so many amazing photos to take during Daffodil Festival, but I have a few top picks! 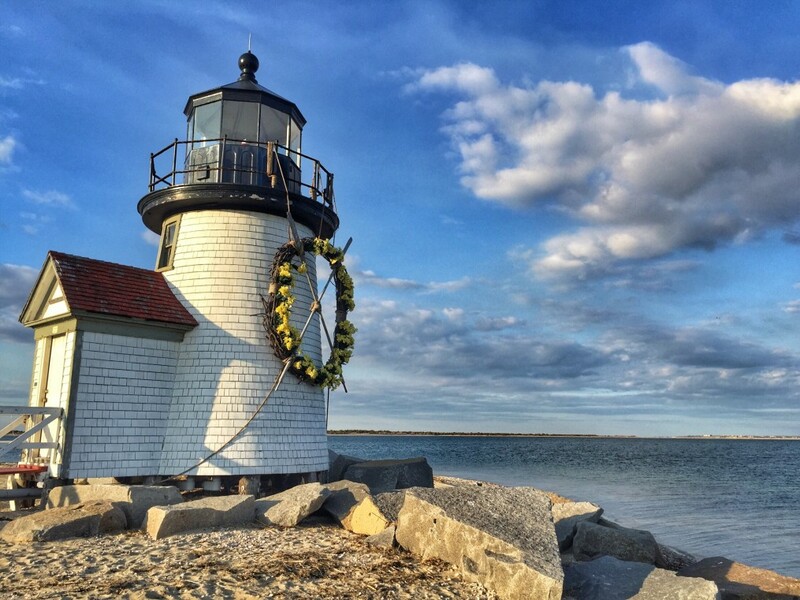 Don’t miss snapping a family photo at Brant Point Light, which is dressed up with a gorgeous yellow wreath! 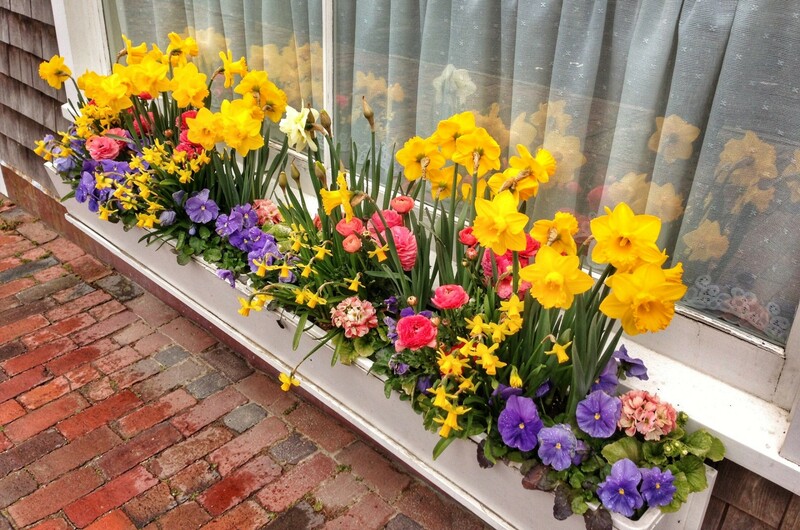 Take your time and explore the little side streets off Main Street and Upper Main Street where you will often find the most eye-catching spring window boxes and planters. If you can wake up early and beat the crowds, one of my favorite shots is always of the beautifully decorated light post/planter that sits in the center of Main Street. Lastly, as mentioned above, Sankaty Head Lighthouse is an important sight to see this time of year! -If you’re planning to post on social media during Daffodil Festival, use the hashtags #ACKDaffy18 and #Daffy18. Additionally, if you want to check out the outfits and scenery from last year’s festive weekend, you can search Instagram/Twitter using the same hashtags, but with a 17 at the end, #ACKDaffy17 and #Daffy17. -Just as you would on a busy summer weekend or during Christmas Stroll and Figawi, make dinner reservations ASAP! While most restaurants will take walk-ins, the wait times during a holiday weekend can be super long. No reservations available? Try checking in at your desired spot on the early or late side to beat the crowds, or if you have access to a car, head to one of the restaurants on mid-island, as less tourists will leave town for a meal.